Time for a new challenge at A Blog Named Hero and it's all about getting shabby/chic! I inked up the tag background with Soft Granite ink, stamped the flower on top and used a wet paintbrush to add a dab of water to the centre of each bloom so that the ink would bleed and blur a little. I also added a dot of sparkle to each petal with a Stardust pen. To get a good colour match for the ribbon I ran the same ink I used on the hydrangea image along some seam binding, spritzed it with water, crinkled it up and let it dry. For the pink background I stamped the script with Soft Blossom ink for a tone-on-tone look and then inked up the Starburst Lace in white pigment ink and stamped it three times on top of the script. 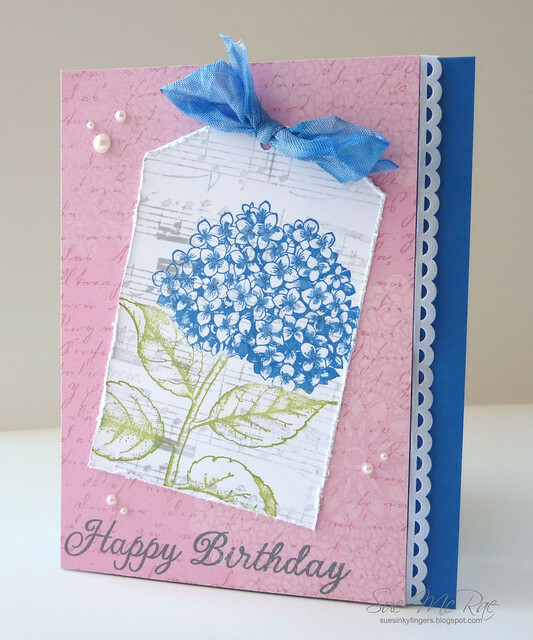 I added the sentiment, some white lace and pearls to finish off the card. 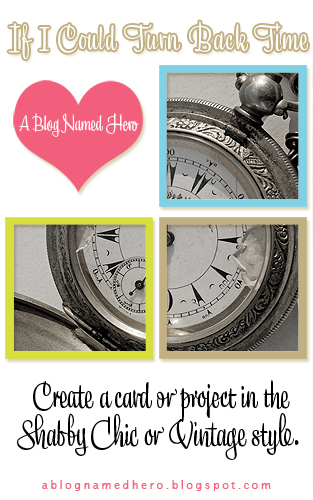 Now it's your turn to join in and make a shabby/chic project. 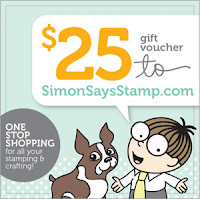 The challenge runs for 2 weeks and you could be the lucky winner of a gift voucher from the Simon Says Stamp Store. Oh, do I ever love these colors, Sue! Your card is really beautiful! Stunning card - I love the colours!